On An Overgrown Path: Is classical music selling itself too cheaply? Is classical music selling itself too cheaply? This satellite photo shows the Fukushima 1 Nuclear Power Plant which suffered catastrophic failure after the 2011 Tōhoku earthquake and tsunami. The six reactors at Fukushima were designed by General Electric (GE), and a 2011 New York Times report was headlined "Experts had long criticized potential weakness in design of stricken reactor", and went on to report " GE began making the Mark 1 boiling-water reactors in the 1960s, marketing them as cheaper and easier to build — in part because they used a comparatively smaller and less expensive containment structure". 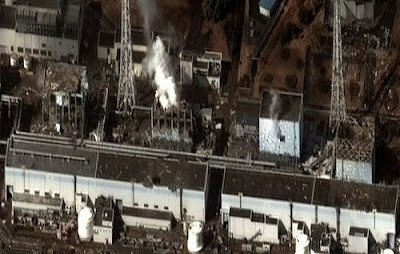 A recent study by Stanford University suggests up to 1300 deaths and another 2900 cancer related illnesses will result from the Fukushima disaster. On Sunday July 29th the Aldeburgh World Orchestra with conductor Mark Elder performs at the BBC Proms. This newly formed orchestra brings together one hundred and twenty-four top young musicians from around the world as part of the Cultural Olympiad. A standalone credit on the Aldeburgh World Orchestra website reads "Supported by a generous gift from General Electric on behalf of Sir William Castell". Another of the orchestra's funders is the London 2012 Festival, which in turn includes oil multinational BP among its sponsors. Sir William Castell held executive directorships of GE subsidiary companies before becoming a group non-executive director, leaving the latter position in 2011. He also served on the board of BP for six years and was their senior independent director and also safety committee chairman for two of those years. In February 2012 Sir William left BP, this was a year after his re-election as a director was opposed in a shareholder revolt over BP's safety record following the 2010 Deepwater Horizon environmental disaster. A strong defence can be mounted of the Aldeburgh World Orchestra sponsorship. GE is recognised by Newsweek as being in the top 100 green companies, and the company contests allegations that shortcomings in the reactors' containment structure contributed to the Fukushima disaster and has many business activities besides nuclear power. Sir William Castell serves on the board of the Wellcome Foundation, a global charitable trust. Then there is the argument that the team at Aldeburgh Music are such a force for artistic good. And, of course, an orchestra needs an awful lot of funding. But, despite all this, the view that classical music, like the Olympics, is selling itself to the corporate sector too cheaply - both ethically and financially - is becoming increasingly widespread. Yes, commercial sponsorship is the lifeblood of most arts organisation, but is there not a middle way? Could not the Association of British Orchestras and similar industry bodies implement a voluntary agreement as follows. At point of performance - that is on orchestra websites and press releases, in concert programmes, etc - all non-public sector sponsorship to be anonymous with no identification of company or individual names. But away from point of performance sponsors can identify themselves - for instance on corporate websites, in their annual reports and PR material etc. That way the sponsors still get the required nice warm feeling, orchestras get their funding, but classical music is not directly endorsing what are sometimes ethically compromised funders. Some sponsors will be lost and belts will need to be tightened further if such an agreement was implemented. But those sponsors that remain will be there because they are committed to supporting classical music, and not just using it to polish their tarnished corporate reputations. Other views on the feasibility of a voluntary agreement are welcome. But remember, while classical music debates nothing changes. Meanwhile enjoy the Prom. Also on Facebook and Twitter. Any copyrighted material on these pages is included as "fair use", for the purpose of study, review or critical analysis only, and will be removed at the request of copyright owner(s). Report broken links, missing images and errors to - overgrownpath at hotmail dot co dot uk Version 1.2. V1.1 changed headline. V1.2 expanded para 4.